QUIZ – What's My Medical Type? Families come in all shapes and sizes. Whether you are on your own, have little ones at home, or tend an empty nest, medical coverage is a must. 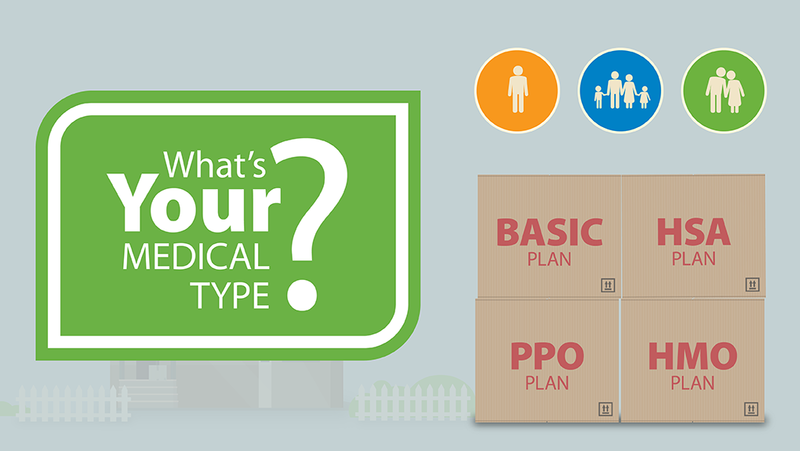 Sysco offers 4 different medical plans. Be there just in case something terrible happens, so that I have the coverage I need and won't go broke paying medical bills. Give me good coverage at a good price and come with a way to save for future medical costs. Be the same as what I've always had, even if I have to pay more out of my pocket and my paycheck. Be cheap to use when I need it, even if it means paying more from every paycheck. How much are you willing to spend on medical coverage each payday? I don't want to spend more than I need to. I want a good value. I can afford to stay with what I know. I'm willing to pay more than I do today. You aren't feeling well on Monday. On Wednesday, you are running a slight fever and have bad congestion. What do you do? I'll take some cold medicine to get through my shift, then sleep as much as possible. I'll call my doctor if it isn't better next week. I call my doctor's office to ask their nurse for her opinion. I go to the urgent care clinic. I schedule an appointment with my doctor. Your daughter just got her first job with medical benefits. What's your advice to her? Go with the lowest cost plan since she is young, healthy and may not even use her benefits. Look for a plan that gives her a health savings account. If she starts saving now, she will be set when she retires. Go with the PPO. It might cost a little more, but it's easy to use. Get the HMO. They are expensive in paycheck costs, but she won't have to worry about paying for care. How important is the provider network in the plan you choose? I don't really ever go to the doctor. So, it's not that important. I want to make sure my doctor is in the network so I can get the best rates. It's easier to use a doctor in the network, but I don't mind spending more to use an out-of-network doctor. I will go to any doctor covered by my plan and let them refer me to someone if I need a specialist. I don't really have a doctor that I see regularly, so that's not important in my annual decision making process. It's Tuesday at 7p.m. Your 4 year-old child isn't feeling well. Her temperature is 101 and you notice a rash on her chest and back. What do you do? Watch her closely. Call the pediatrician in the morning if she isn't better. Go to the urgent care or local ER if she gets worse or if she isn't better in a few hours. Go to the ER right away. If it meant you could save up to $1,500 next year, would you be willing to spend an extra 30 minutes on your healthcare each month? Not something I can do right now. Smart! I like saving money AND paying less in taxes. Unnecessary. Let's worry about tomorrow, tomorrow. The data has been crunched. The results are in! Remember, this quiz is intended to help you narrow down your options. It's no substitute for your own judgment. Carefully review your options before you make your final decision. You can find the information and tools you need in your benefits guide. You can also use the health cost estimator found in the enrollment system to model your costs under each of the plans Sysco offers. The HSA plan is a Consumer Directed Health Plan coupled with a Health Savings Account. This plan comes with good coverage at a lower cost than most associates are paying today. It allows you to save pre-tax dollars to pay for your care. You can even keep your leftover dollars to pay for care in future years or in retirement. The PPO plan offers more comprehensive coverage for a higher paycheck cost. The deductible is lower than the HSA plan but you will miss out on the Health Savings Account and Sysco contribution. The National HMO plan offers you the highest level of coverage for the highest paycheck cost. You must use in-network providers and get referrals to see specialists. The Basic plan offers a lower level of coverage for a lower paycheck cost.